CBI - China: Day 126 of 142 of the 1st Battle of Hebei. USA: The German zeppelin Hindenburg, while attempting to land at Lakehurst, New Jersey, explodes in a spectacular fireball. 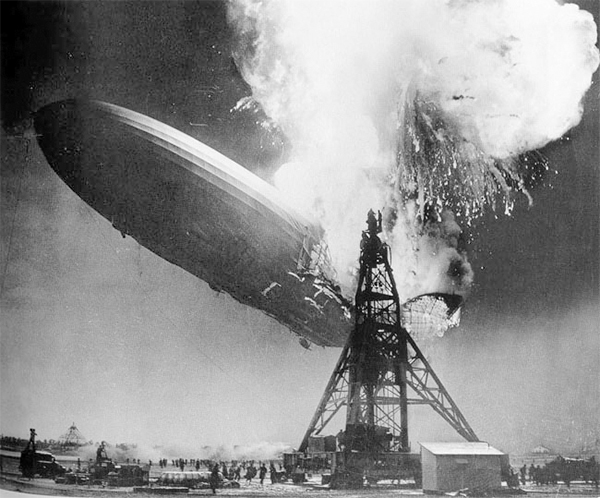 The German passenger airship LZ 129 Hindenburg caught fire and was destroyed during its attempt to dock with its mooring mast at the Lakehurst Naval Air Station, which is located adjacent to the borough of Lakehurst, New Jersey, some 75 miles south of New York City. Of the 97 people on board (36 passengers, 61 crew), there were 35 fatalities; there was also one death among the ground crew. The disaster is well recorded due to the significant extent of newsreel coverage and photographs, as well as Herbert Morrison's eyewitness radio report for station WLS in Chicago, which was broadcast the next day. Heavy publicity about the first transatlantic passenger flight of the year by Zeppelin to the US attracted a large number of journalists to the landing (the airship had already made one round trip from Germany to Brazil that year). Morrison's broadcast remains one of the most famous in history. Parts of it were later dubbed onto the newsreel footage, giving the impression that the words and film were recorded together. His plaintive "Oh, the humanity!" has been widely used in popular culture. Part of the poignancy of his commentary is due to its being recorded at a slightly slower speed, so that when it is played back at normal speed, it seems to have a faster delivery and higher pitch. When corrected, his account is less frantic sounding, though still impassioned. Spain: Day 294 of 985 of the Spanish Civil War. MTO - Italy: Hitler appears in Rome with Mussolini for a military review of Italian troops. Spain: Day 659 of 985 of the Spanish Civil War. CBI - China: Day 304 of 2,987 of the 2nd Sino-Japanese War. Day 89 of 124 of the Battle of Henan. UK: The British ships KING GEORGE VI and QUEEN ELIZABETH arrive in Canada. Each ship carries about 15 million Pounds Sterling in gold for safekeeping. CBI - China: Day 669 of 2,987 of the 2nd Sino-Japanese War. Day 51 of 54 of the Battle of Nanchang. Day 17 of 35 of the Battle of Suizao. ETO - Norway: Day 28 of 63 of the Battle of Norway. The Germans continue advancing north from Trondheim to Narvik. Meanwhile, Norwegian gold reserves arrive in London. ETO - France: Hitler again delays X-Day, his invasion of France, and reschedules it for the 10th of May. Meanwhile, some German troops are spotted driving through the Ardennes, but the Belgian Army does not respond. CBI - China: Day 1,035 of 2,987 of the 2nd Sino-Japanese War. Day 174 of 381 of the Battle of South Guangxi. Day 6 of 49 of the Battle of Yichang. USA: Republic Aviation's P-47 Thunderbolt fighter plane (aka the "Jug") makes its maiden flight. It was the largest, heaviest and most expensive fighter aircraft in history to be powered by a single piston engine. The P-47 was heavily armed with eight .50-caliber machine guns, four per wing. When fully loaded, the P-47 weighed up to eight tons, and in the fighter-bomber ground attack roles could carry five inch rockets or a significant bomb load of 2,500 pounds - over half the weight the famous B-17 bomber could carry on long-range missions. It served with other Allied air forces, as well, notably France, the UK and the USSR. Mexican and Brazilian squadrons fighting alongside the US were equipped with the P-47. Note: The term "single piston engine" does not mean that it had but one cylinder. 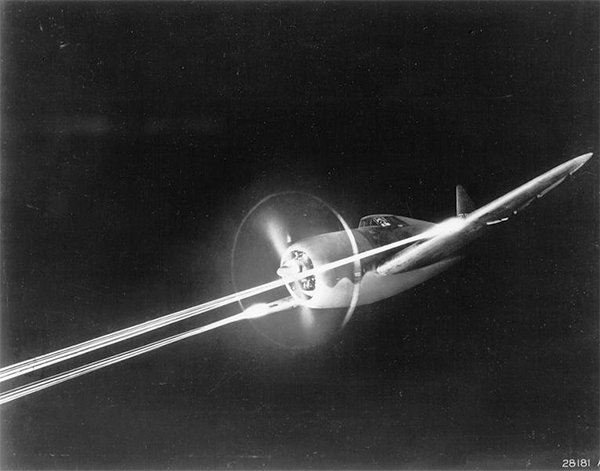 The massive P-47 engine had 18 cylinders. USA: The US Secretary of War advocates US Navy protection for British supply convoys. Atlantic: The German sub U-97 sinks the British ocean boarding vessel HMS CAMITO and the recently captured Italian tanker SANGRO 500 miles west of Ireland. Atlantic: German subs U-103 and U-105 sink 3 more British freighters off Sierra Leone, British West Africa. ETO - UK: Day 243 of 258 of the Blitz. German bombers attack Liverpool for the sixth consecutive night. Germany: Polish doctor Zygmunt Klukowski notes in his diary that today he has observed Germans conscripting Polish civilians to build military airfields and air raid bunkers even though there wasn't any active war in Eastern Europe. USSR: Stalin proclaims himself the Chairman of the Council of People's Commissars, thus taking over as the actual head of the Soviet government, which position was previously held by Vyacheslav Molotov. MTO - Greece: British General Bernard Freyberg receives intelligence that the Germans are likely to launch a large airborne assault on Crete on 17 May. However, he continues to believe the invasion will come from the beaches rather than the sky. MTO - Libya: Day 27 of 256 of the Siege of Tobruk. The German 8th Panzer Regiment arrives in North Africa. MTO - Italy: The British submarines HMS TAKU and HMS TRUANT sink the Italian ship BENGASI off Italy. Middle East: Day 5 of 30 of the Anglo-Iraqi War in Iraq. The last brigade of the British 10th Indian Division arrives at Basra. Meanwhile, Axis planes begin to land at the Mosul airfield in northern Iraq. Iraqi troops withdraw from the plateau overlooking RAF Station Habbaniya after suffering 1,000 casualties. They are pursued by the British King's Own Royal Regiment, which catches up with the Iraqi troops at Sinn El Dhibban and takes them prisoner. Middle East: Vichy France and Germany sign the Paris Protocol, which gives permission for German troops to march through Syria to Iraq to reinforce the Iraqis. In return, Germany lowers the daily tribute that France has to pay Germany from 20 million to 15 million Reichsmarks. East Africa: Day 331 of 537 of Italy's East African campaign in the lands south of Egypt. CBI - China: Day 1,400 of 2,987 of the 2nd Sino-Japanese War. CBI - Thailand: Day 218 of 221 of the Franco-Thai War (Vichy France vs Thailand). Atlantic: Day 113 of 169 of Germany's Second "Happy Time," during which U-boats sink 609 Allied ships with little risk. U-333 sinks the US tanker HALSEY east of Port St Lucie, Florida. U-507 sinks the US freighter ALCOA PURITAN south of Mobile, Alabama. Russian Front - North: Day 241 of 872 of the Siege of Leningrad. Russian Front - North: Day 88 of 102 of the Battle of the Demyansk Pocket, another failed attempt to break the siege at Leningrad. Russian Front - North: Day 2 of 658 of the Siege of the Kholm Pocket. Russian Front - South: Day 189 of 248 of the Siege of Sevastopol, Crimean Peninsula. East Africa: Day 2 of 186 of the Battle of Madagascar. CBI - Burma: Day 144 of 164 of Japan's Invasion of Burma. US 10th Air Force B-17s bomb Mingaladon Airfield for the second consecutive night. CBI - China: Day 1,765 of 2,987 of the 2nd Sino-Japanese War. PTO - Malaya: Day 77 of 357 of the Battle of Timor Island. PTO - New Guinea: Day 4 of 5 of Japan's Operation MO to take Australian New Guinea. US 5th Air Force B-17s unsuccessfully attack shipping near Bougainville Island. PTO - Philippines: Day 150 of 152 of the 1st Battle of the Philippines. Day 2 of 2 of the Battle for Corregidor. After an unsuccessful counter-attack, the US surrenders the island to the Japanese. PTO - Solomon Islands: Day 3 of 5 of the Naval Battle of the Coral Sea. The US and Japanese carrier planes continue clashing. Atlantic: The British corvette HMS LOOSESTRIFE sinks German sub U-638 with depth charges. Germany: Hitler makes one of his increasingly rare public appearances as he attends SA leader Viktor Lutze's funeral in Berlin. Russian Front - North: Day 606 of 872 of the Siege of Leningrad. Russian Front - North: Day 367 of 658 of the Siege of the Kholm Pocket. MTO - Tunisia: Day 171 of 178 of the Battle of Tunisia. British troops capture Tunis while the US takes Bizerte. The German 15th Panzer Division is effectively wiped out. US 9th and 12th Air Forces provide air support. CBI - China: Day 2,130 of 2,987 of the 2nd Sino-Japanese War. PTO - Alaska: Day 334 of 435 of the Battle of Kiska, Aleutian Islands. US 11th Air Force attacks targets on Attu and Kiska. PTO - Japan: The USS GAR sinks a Japanese schooner in daylight with her deck gun. PTO - New Guinea: Day 15 of 148 of the 2nd Battle of Lae-Salamaua. US 5th and 13th Air Forces provide air support. ETO - France: US 8th Air Force B-17s and B-24s bomb V-weapon targets at Pas de Calais and Siracourt. Germany: The younger workers in the Lodz ghetto in Poland begin a hunger strike in protest of the watery soup that makes up the bulk of their daily food intake. Russian Front - North: Day 95 of 191 of the Battle of the Narva Isthmus, Estonia. Both German and Soviet troops remain in their defensive positions. Russian Front - South: Day 29 of 35 of the Battle of the Crimea. The Soviets bombard Sevastopol using Katyusha rocket launchers. Russian Front - South: Day 29 of 60 of the Battle of Romania, 1st Jassy Offensive. Day 5 of 7 of the 2nd Battle of Targu Frumos. MTO - Romania: US 15th Air Force B-17s and B-24s hit about a half a dozen targets in Romania. MTO - Italy: Day 111 of 123 of the Battle of Monte Cassino. RAF and US Air Forces provide air support. The German Gustav Line continues getting weaker. MTO - Italy: Day 106 of 136 of the Battle of Anzio. RAF and US Air Forces provide air support. CBI - Burma: Day 63 of 166 of the UK's Operation THURSDAY. British Army junior officer John Randle takes out a Japanese machine gun position, then purposefully sacrifices himself while taking out a bunker with a grenade. For his actions he is awarded the Victoria Cross. CBI - Burma: Day 58 of 147 of the Battle of Myitkyina. US 10th Air Force provides air support. CBI - Burma: Day 36 of 302 of the Chinese Salween Offensive. US 14th Air Force provides air support. CBI - China: Day 2,496 of 2,987 of the 2nd Sino-Japanese War. Day 20 of 259 of Japan's Operation ICHI-GO. Day 20 of 39 of the Battle of Central Henan, the first offensive in Japan's Operation ICHI-GO. Chinese troops are getting pushed out of central China. CBI - India: Day 60 of 118 of the Battle of Imphal-Kohima. Japanese Zero fighters attack Bishenpur near Imphal. Japanese troops make an attack on Tengnoupal not far from Kohima. CBI - India: Mahatma Gandhi is released from prison due to health reasons. He had been interned in the luxurious palace of Aga Khan III at Poona since August of 1942. PTO - New Guinea: Day 68 of 80 of the Battle of the Admiralty Islands. 5th Air Force provides air support. PTO - New Guinea: Day 144 of 597 of the Battle of New Britain. US 13th Air Force provides air support. PTO - New Guinea: Day 15 of 481 of the Battle of Western New Guinea. PTO - Solomon Islands: Day 188 of 295 of the Battle of the Bougainville Islands. US 13th Air Force provides air support. Germany: Mildred Gillars, aka Axis Sally, delivers her last propaganda broadcast to Allied troops (the first was on 11 Dec 41). 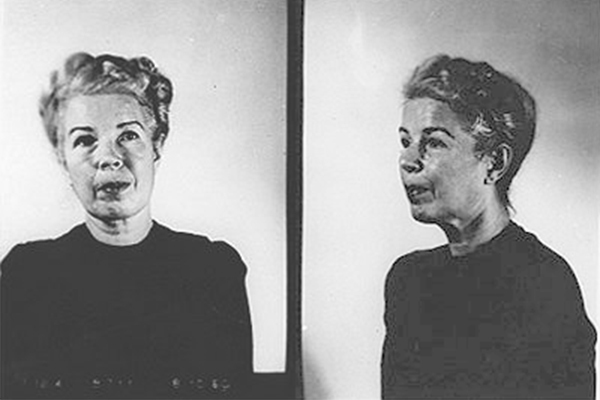 She will be convicted of treason by the United States in 1949 following her capture in post-war Berlin. Axis Sally served her 10-to-30 year sentence at the Federal Reformatory for Women in Alderson, West Virginia. She became eligible for parole in 1959, but did not apply until 1961. She was released on June 10, 1961. Atlantic: Day 2 of 2 of the Battle of Point Judith. Just off Block Island, Rhode Island, German U-boat U-853 is discovered by Navy blimps and is sunk by US destroyers. Atlantic: US destroyers sink the German sub U-881 in the North Atlantic, while the RAF sinks U-3523 in the Baltic Sea. ETO - Netherlands: The Dutch Nazi Party (Nationaal-Socialistische Beweging) is outlawed. US 8th Air Force drops food and other supplies at Schipol, Alkmaar, Vogelenzang, Utrecht and Hilversum. ETO - France: Day 281 of 284 of the Battle of Brittany. ETO - France: Day 234 of 236 of the Siege of Dunkirk. ETO - Portugal: Portugal severs all diplomatic ties with Germany. Germany: Grand Admiral Dönitz announces that Himmler is to be relieved of all government duties. He also abolishes the Schutzstaffel in all its forms and bans any further resistance by members of the SS. Russian Front - Center: Day 204 of 206 of the Battle of the Courland Pocket in Latvia. Russian Front - Center: Day 21 of 23 of the Battle of Settin-Rostock, both sides of the border between Germany and Poland. Russian Front - Center: Day 4 of 6 of the Battle of Brandenberg, Germany. Russian Front - Center: Day 83 of 83 of the German Siege of Breslau (today Wroclaw, Poland). The 40,000 German defenders surrender to the Soviets. Russian Front - Center: Day 1 of 6 of the Battle of Prague. The Soviets launch a final assault of Czechoslovakia against what's left of the German Army. MTO - Austria: From Italy, the US 5th Army enters into southern Austria through the Brenner Pass as the German troops in Austria announce their surrender. CBI - Burma: Day 92 of 99 of the Battle of Pakokku and Irrawaddy River operations in central Burma. British and Indian troops cut off 20,000 very sick and hungry Japanese troops. CBI - Burma: Day 12 of 12 of the Battle of Rangoon. US 10th Air Force provides air support. The British and Indian troops have secured Rangoon. CBI - China: Day 2,861 of 2,987 of the 2nd Sino-Japanese War. Day 36 of 91 of the Battle of Zhijiang. US 14th Air Force provides air support. Day 28 of 60 of the Battle of West Hunan (near Zhijiang). Japanese troops continue withdrawing from southern China. PTO - Dutch East Indies: Day 6 of 52 of the Battle of Tarakan Island. PTO - Japan: The British Pacific Fleet shells the Japanese positions on the Sakishima Islands of the Ryukyu Islands, 550 miles south of Japan. PTO - Japan: Day 36 of 83 of the Battle of Okinawa. The British aircraft carrier HMS FORMAIDABLE is hit by kamikaze planes but her steel decking saves her. PTO - Marshall Islands: US 7th Air Force attacks targets in the Truk Atoll, hit the airfield on Moen Island, nail the seaplane base at Dublon Island and attack shipping off Param. PTO - New Guinea: Day 496 of 597 of the Battle of New Britain. US 10th Air Force provides air support. PTO - New Guinea: Day 380 of 481 of the Battle of Western New Guinea. US 10th Air Force provides air support. PTO - Philippines: Day 199 of 299 of the 2nd Battle of the Philippines, aka the Liberation of the Philippines or the Philippines Campaign. PTO - Philippines: Day 143 of 244 of the Battle of Luzon. 5th Air Force provides air support. PTO - Philippines: Day 58 of 159 of the Battle of Mindanao Island. 5th Air Force provides air support. PTO - Philippines: Day 50 of 135 of the Battle of the Visayas region. US 5th and 7th Air Forces provide air support.